Curator William Greenwood takes a fresh look at some of the scientific instruments that will feature in the new Albukhary Foundation Galleries of the Islamic world, opening in October 2018. Made by Abd al-Karim al-Misri/al-Madrabi, Detail of rete showing star pointers, brass with silver and copper inlay, AH633 (1236AD), probably Mayyafariqin (Turkey). It’s not every day that you get to hold the universe in your hand. The closest that most of us get to this sensation is searching for something on our phones, but for the real deal, there’s nothing quite like an astrolabe. These devices – which range from pocket-sized and practical to weighty presentation pieces – are not only scientific instruments, but also masterpieces of art and design. In October 2018 the Museum will open two new galleries – the Albukhary Foundation Galleries of the Islamic world. On display will be a range of scientific material. In preparation for this exciting new development, I’ve been taking a fresh look at astronomy and astrology and wanted to share some of the highlights with you. Nowadays we have an abundance of devices, apps and other information which help us to know where we are, what time it is, and other essentials of everyday life. Before all this, however, was the astrolabe. Astrolabes are complex devices which use several moving parts to turn raw data provided by the user into practical information – in many ways, they were the computers of their time, used to solve problems relating to the position of the sun, stars, planets and timekeeping. 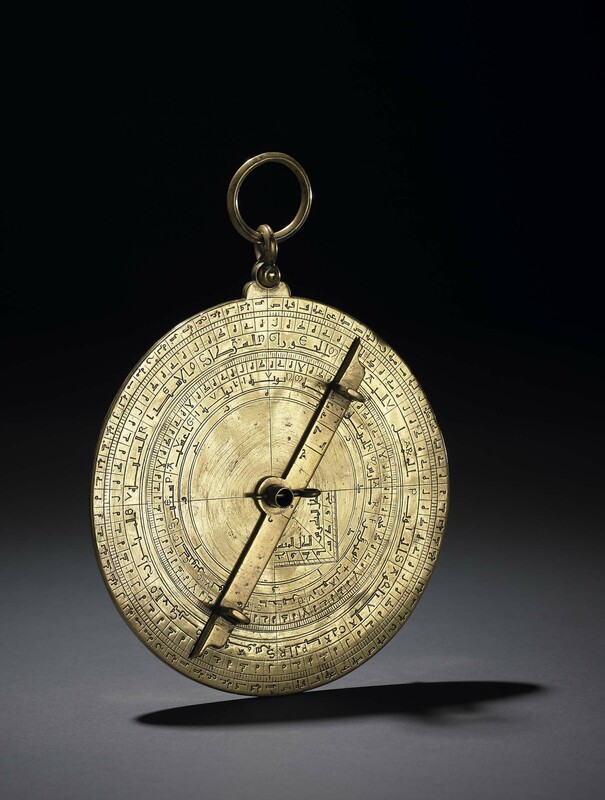 In the 10th century, one astronomer estimated that there were around a thousand possible applications for an astrolabe, ranging from the position of the stars or the direction of Mecca to the height of a building. The name is derived from the Greek astro labos (star-taker), which points to the fact that they were probably invented in ancient Greece, before being transmitted into the Islamic world from the 7th century AD onwards. Knowledge of the skies, now called astronomy, was an important aspect of Islamic culture from earliest times. Scientists and thinkers in the Islamic world built on Babylonian, Greek, Indian and pre-Islamic Arabian sources translated into Arabic to make huge advances in the study of the heavens. Astronomy today is the scientific study of celestial objects and phenomena – stars, planets, the moon, comets, and eclipses. 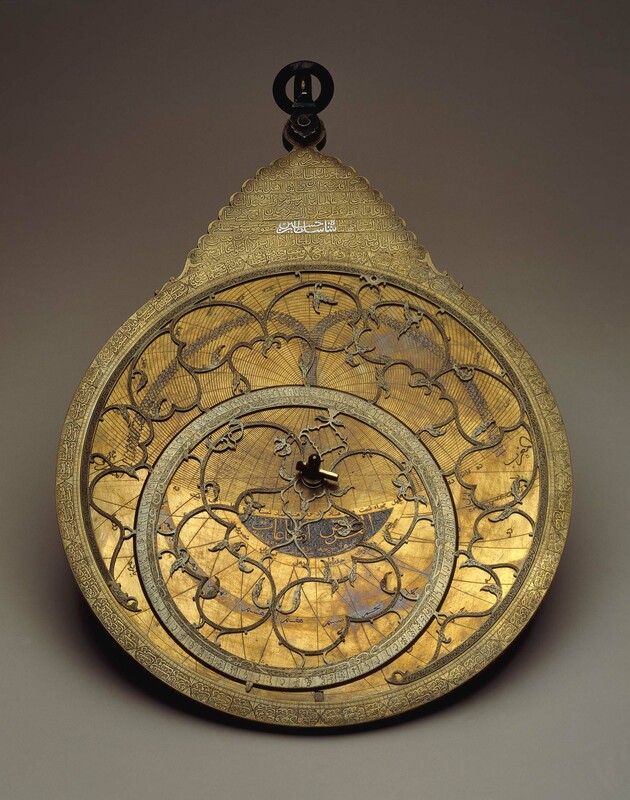 Muslim astronomers, driven by such needs as determining prayer times and the direction of Mecca, developed and refined scientific instruments to cater to these requirements, including the astrolabe. An astrolabe is made up of four key elements – rete, plates, mater, and alidade. The rete sits at the front of the device, acting as a map of the heavens with each pointer picking out a particular star. This can be rotated to reflect what the user sees in the sky – a particular star, or the sun, for example. An astrolabe will normally have several plates held within it, which can be swapped depending on how far north or south the user is. The rete and plates sit inside the mater, the back of which is engraved to verify times, dates, signs of the zodiac and other information. This is done using the alidade, a kind of ruler on the back of the astrolabe which is used to work out information. This example, heavily inlaid with silver and copper, features striking figural imagery on its front and back. It is signed Abd al-Karim al-Asturlabi (the Astrolabist) and the titles of three possible royal patrons – al-Malik, al-Mu‘izz and Shihab al-Din – have also been engraved on the back. This elite patronage, its large size and extensive decoration suggest that it was a presentation piece meant to be admired rather than used. Made for the last Safavid ruler of Iran, Shah Sultan Husayn (r. 1694–1722), this is an exceptionally large instrument. Although astrolabes were usually designed to be portable, this one is so heavy that it was probably only meant for use in one place – possibly a mosque built or renovated by the ruler himself. The leafy design of the star pointers may refer to the gardens of paradise, linking the skies to heaven itself. Originally in the collection of Sir Hans Sloane, this was one of the first Islamic objects in the British Museum’s collection. 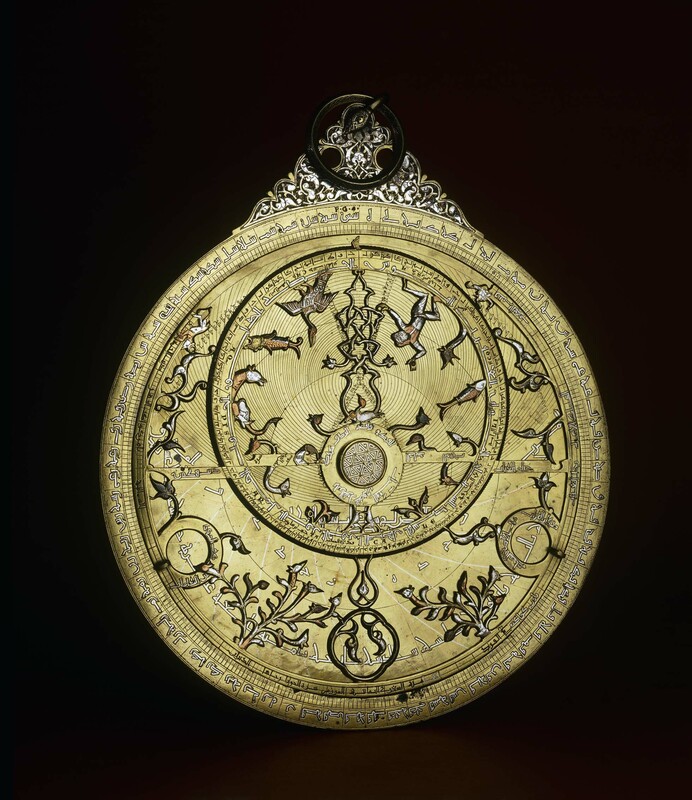 Astrolabe made by Abd Ali ibn Muhammad Rafi al-Juzi and decorated by Muhammad Baqir. Brass with silver inlay, Iran, Sha’ban AH 1124 (September/October AD 1712). 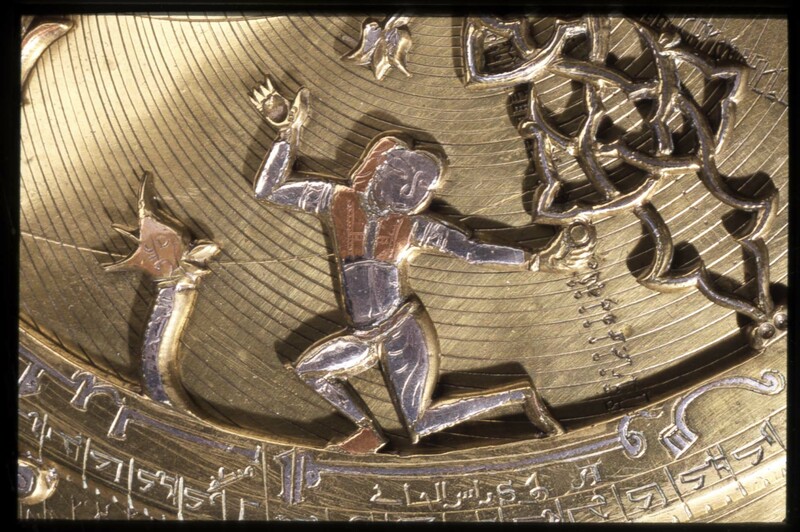 Having passed from ancient Greece into the Islamic world, astrolabes eventually became part of European scientific culture. Made for use at Spanish sites from Ibiza to Zaragoza, this astrolabe features both Arabic and Latin script. Copper-alloy astrolabe, maker unknown. Spain, 1200–1400. The Latin was added at a later date – a neat metaphor for Europe basing its scientific knowledge on Islamic foundations, much of which passed north across the Pyrenees and into western Europe around the time that this instrument was made. In fact, the first technical manual in English – written in 1391 by none other than Geoffrey Chaucer, author of The Canterbury Tales – is a treatise on the use of astrolabes. The British Museum’s new Albukhary Foundation Galleries of the Islamic world will open in October 2018.